Introduction. 2. Review of generalized multipole technique literature. 3. The multiple multipole program (MMP) and the generalized multipole technique (GMT). 4. Models of electromagnetic scattering problems based on discrete sources method. 5. Singularities of wave fields and numerical methods of solving the boundary-value problems for Helmholtz equations. 6. Yasuura's method, its relation to the fictitious-source methods, and its advancements in the solution of 2-D problems. 7. The method of auxiliary sources in electromagnetic scattering problems. 8. Numerical solution of electromagnetic scattering problems of three dimensional nonaxisymmetrical bodies on the foundation of discrete sources method. 9. Hybrid GMT-MoM method. 10. Null-field method with discrete sources. 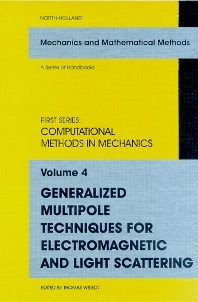 This book is an edited volume of nine papers covering the different variants of the generalized multipole techniques (GMT). The papers were presented at the recent 3rd Workshop on Electromagnetics and Light Scattering - Theory and Applications, which focused on current GMT methods. These include the multiple multipole method (MMP), the discrete sources method (DSM), Yasuura's method, method of auxiliary sources and null-field method with discrete sources. Each paper presents a full theoretical description as well as some applications of the method in electrical engineering and optics. It also includes both 2D and 3D methods and other applications developed in the former Soviet Union and Japan.